Provide comfort for the family of Deborah Acker with a meaningful gesture of sympathy. 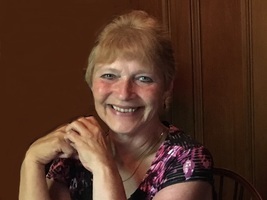 Our Mom, Deborah K. Acker, 60, of Waterville, passed away Wednesday, March 20, 2019 at Faxton-St. Luke’s Healthcare surrounded by her loving family. Mom was born July 4, 1958 in New Hartford, the daughter of the late Robert B. and Betty P. Kniffin and was a graduate of New Hartford High School. On June 12, 1976, she married Gary F. Acker. Many knew her from her days as branch manager of the bank in Waterville. For the last 10 years she was employed by Defense Finance and Accounting Services (DFAS) in Rome. She was a member of Waterville Rotary and was an avid member of the First Presbyterian Church in Waterville, where she shared her voice in the choir for many years. Our mom was a talented seamstress, who loved sewing clothing for her grandchildren- especially their much-loved Christmas pajamas. She loved a good cup of tea. Gardening, working outside on her lawn, traveling, camping, and spending time with her family were especially important to her. Mom is survived by her loving, faithful companion- our father, Gary Acker of Waterville; her children, Jason (Courtney) Acker of Waterville; Daniel (Debra) Acker of New Hartford; Ryan (Jane) Acker of Nassau, NY; Erin (Timothy) Graham of Brighton, CO; sisters and brothers-in-law, Sharon Wormwood of Clifton Park; Pam (Bruce) Youmans of Brookfield; Robin (Brian) Kruse of Taunton, MA; her beloved grandchildren, Garent, Jude, Ava, Aidan, Kairi, Colin, Barrett, and Lillie; several nieces, nephews, and cousins. The family offers their heartfelt thanks to the nurses and staff on the 6th floor and ICU unit of Faxton- St. Lukes Healthcare for their kindness and compassion. Funeral services will be held at Noon on Sunday, March 24, 2019 at the Three Steeples Church, Paris Hill, NY. Interment will be at a later date in St. Bernard’s Cemetery, Waterville. Friends are invited to call at the Burgess & Tedesco Funeral Home, 210 E. Main St., Waterville on Saturday from 4-6pm. To send flowers in memory of Deborah K. Acker (Kniffin), please visit our Heartfelt Sympathies Store. We encourage you to share your most beloved memories of Deborah here, so that the family and other loved ones can always see it. You can upload cherished photographs, or share your favorite stories, and can even comment on those shared by others. Love, Tim & Sarah, Steph & Rob, Becky & Mark, Mark, Linda, Kate, Jennie and family, and others have sent flowers to the family of Deborah K. Acker (Kniffin). So sorry to hear of DEBBIES passing, I remember her from school. Alan Chwalek.